Nobody wants to lose hair unnecessarily. People are ready to do anything to prevent hair loss. You may hear of various treatments for hair loss which promise good results. But you cannot be sure whether these claims really work for you or not. Some of the hair fall treatments may use chemicals that can harm your hair and scalp. This can cause damage to your hair, even breaking of hair. So, try not to use products that contain too much of chemicals in them. Instead, you can use natural hair care products. These do not contain any chemicals and therefore do not harm your hair. It is also more effective than those with chemicals in them. Saw Palmetto Hair Loss treatment is one of the natural treatments for hair loss that you must certainly give a try. Saw palmetto is an herb which is excellent for treating hair loss. It is originally found in North America and is a small palm plant. It is most abundant in the coastal states of Atlantic – Florida and Georgia. The fruit of this herb is said to promote growth of hair and prevent hair loss. Other than treating hair loss, saw palmetto is also said to have some health benefits. It is used for treating urinary infections that occur in men and for breast diseases in women. Here we will see how it helps in the treatment of hair loss. Although it is not scientifically proved that saw palmetto can treat hair loss problems, this plant is found to be very effective for treating hair loss. It role in treating this problem is indirect. Consuming saw palmetto helps in preventing 5-alpha-reductase, an enzyme found in the body, from converting testosterone into dihydrotestosterone. Dihydrotestosterone is responsible for the occurrence of androgenic alopecia, which is partial baldness. If this substance is present in high amounts in your body, it may harm the hair follicles and suffocate them, so that no new hair strands grow. Saw palmetto helps in reducing and blocking this element. As a result, loss of hair is greatly reduced and new strands of hair start to grow. How To Use Saw Palmetto for Preventing Hair Loss? If you want to treatment for hair loss or baldness, you have to take saw palmetto orally. This makes sure that it reaches inside your body and works well internally to prevent hair loss. You can also apply saw palmetto externally for treating hair loss problems. But this works very slowly and sometimes it even fails to give positive results. You can take in saw palmetto in two different ways. One way is to swallow it as a whole fruit and the other way is to have it in the form of capsules and tablets. You need to take a dose of 150 mg to 300 mg of saw palmetto per day to treat hair loss. Saw palmetto is gentle and has very little or no side effects when you use it for hair loss treatment. It promotes re-growth of hair to some extent. Consuming the fruit does not treat hair loss instantly. It is a slow process and you have to be patient and consistent. You will start getting visible results only after some time, and that too with regular intake of the fruit. According to some experts, saw palmetto is more beneficial for treating male pattern baldness. However, women can also try it and treat extensive hair loss. What Kind Of Hair Fall Is Best Treated By Saw Palmetto? Saw palmetto is said to be effective for treating male pattern baldness as well female pattern baldness. According to some experts, this fruit is more beneficial for male pattern baldness. However, female pattern baldness is also very effectively treated by saw palmetto because of its good qualities. Alopecia, which a specific pattern of baldness, is treated the best by saw palmetto. Alopecia is a very common type of hair loss found in a majority of people all over the world. In this type of hair loss, you find that the hair loss occurs partially, leading to baldness on top of the head and around the temples. The hairline also starts receding, so that a pattern that resembles a horseshoe is found on the head. This is triggered by wrong life style and having foods that are not very nutritious. Heredity is also a reason for this pattern of baldness. Using saw palmetto is an effective way to treat this type of baldness. How Effective is Saw Palmetto Oil? You can take saw palmetto orally to treat alopecia and get positive results. But the oil that you get from this fruit is also good for preventing hair loss. This oil works best when you apply it directly on your scalp. As mentioned earlier, you have to use it regularly without fail if you want to get positive results. You can treat thinning of hair by applying this oil regularly on your hair. This is because of its lipophilic properties. These contain some active ingredients, which are absorbed by the skin. If you want to get maximum effects of saw palmetto oil, you have to apply this oil on your hair and scalp at night before you go to bed. Massage gently on the scalp with your finger tips for about 15 minutes. This will provide the nourishment and hydration that the scalp requires. Leave it o your hair overnight and then wash of in the morning with water and a mild shampoo. Applying this oil on your scalp helps in making your hair roots strong and this prevents hair from falling. 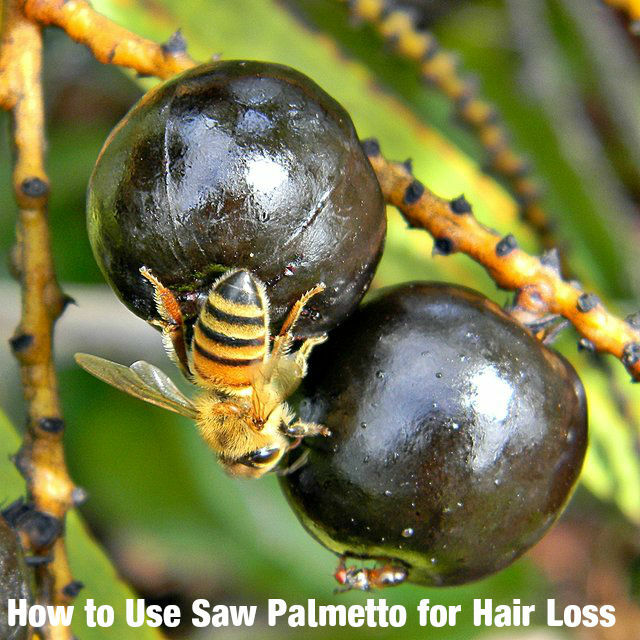 Now that you have seen the uses of saw palmetto and how it can be used for curing and preventing hair loss, try it at home and see the results yourself.